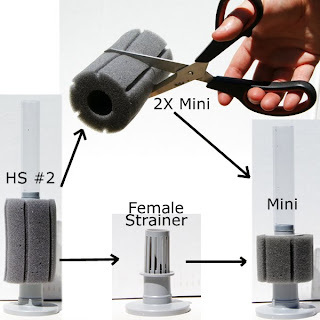 This is a very simple idea where by one uses a Hydro Sponge #2, then one would cut this filter's sponge in half, then remove the male strainer, then finally replace the sponge with this new "1/2" sponge "Mini Hydro Sponge Filter" well suited for a small aquarium (under 2 gallons) or a bowl. The result of this VERY simple DIY Mini filter is an extra sponge for a future change, but just as importantly and unlike other DIY sponge filter ideas circulating here on the internet is you also still have a Quality, Patented Hydro Sponge Filter with higher bio filtration capacity per square inch (or square centimeter) and a sponge (plus spare) that does not degrade quickly. *Much less decomposition in the substrate or bowl bottom that can result in Aeromonas bacterial outbreaks or Saprolegnia (fungus) outbreaks.